John French was born in Santa Fe, NM. When he was three years old, he watched his aunt draw a picture of him and he has been hooked since. As a child, John spent four years in Italy with his Air Force father. Many of his formative years were spent viewing the ancient art and architecture of the Renaissance. After their European Tour they moved to the wild and beautiful Upper Peninsula of Michigan. 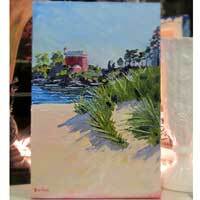 John took several art classes and attended workshops, including one with Michigan’s own Bill Hamilton. 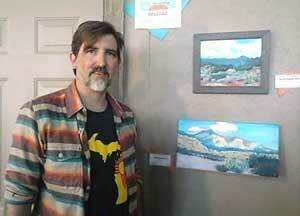 After high school, he took art classes at Northern Michigan University. John gave up college so he could work and support a family, but kept studying on his own. John is one of those self-taught artists. Since mid-2009, John has proudly served on the Board of Directors for The Marquette Symphony Orchestra. In June 2013, he was elected as the President of the MSO’s Board of Directors. In 2015 John was part of the Manzano Mountian Arts Council 25 Years of New Mexico exhibit in Mountainaire, NM. John has also worked at RTI Surgical, formerly known as Pioneer Surgical in Marquette, MI since July of 2000. Besides being a full time artist, John is also a full time husband and dad. 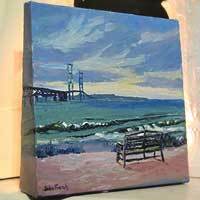 The Art of John French are original oil paintings. 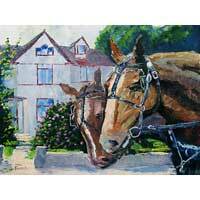 Even though similar paintings can be created, no two are alike. 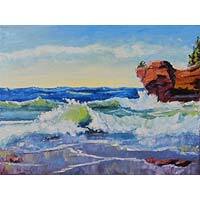 John French oil paintings depict the Northern Michigan landscapes and captures the wild beauty with painting knives and bold, vibrant colors. 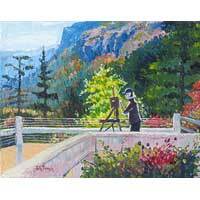 The original oil paintings share the artist’s view of the subject. The Art of John French is a conversation in color, texture and composition.